There are three spaceships docked at the International Space Station including two Soyuz crew ships and one Progress cargo ship. The Expedition 51 crew is waiting for a space delivery mission after welcoming two new crewmates Thursday. 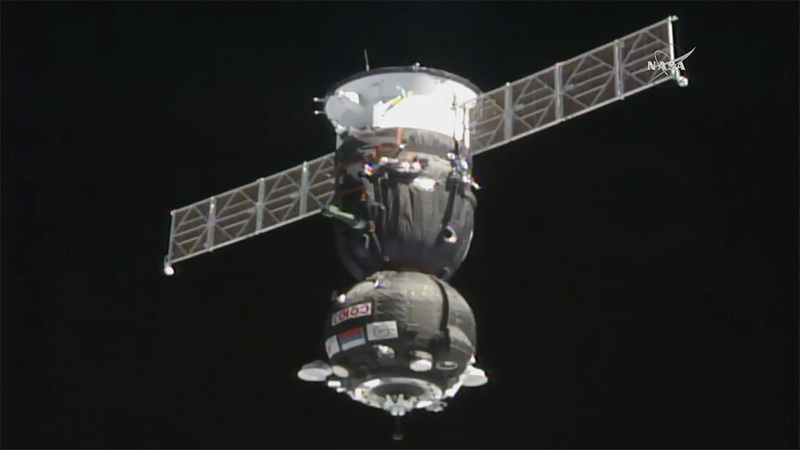 Two astronauts are training for a resupply ship’s arrival as two other crew members are getting used to their new home in space. The Cygnus cargo craft will arrive at the International Space Station early Saturday after a four-day trip to deliver new science experiments and crew supplies. Flight Engineer Thomas Pesquet with assistance from Commander Peggy Whitson will maneuver the Canadarm2 to reach out and capture Cygnus after its final approach. Finally, ground controllers will give the crew a break and remotely control the 57.7 foot robotic arm and install Cygnus to the Harmony module. 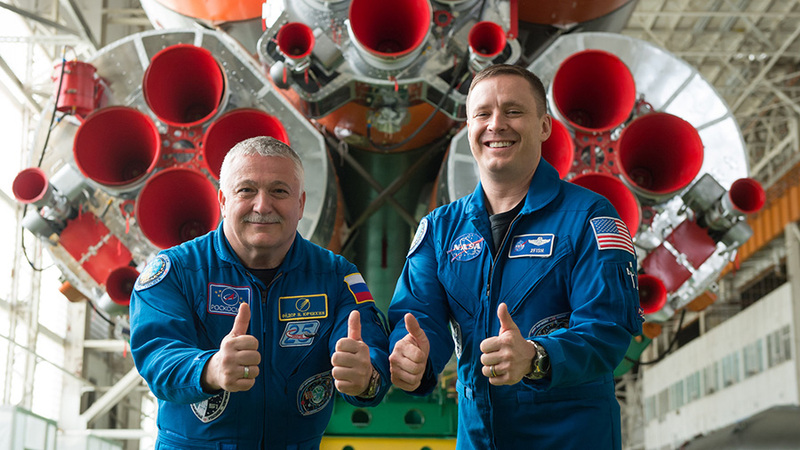 NASA astronaut Jack Fischer is adapting to living in weightlessness for the first time, while his crewmate cosmonaut Fyodor Yurchikhin is beginning his fifth mission in space. The pair joined Expedition 51 Thursday morning just six-hours, 10-minutes after blasting off from Kazakhstan in the Soyuz MS-04 spaceship. They will stay in space until September before returning back to Earth with record-setting astronaut Whitson. 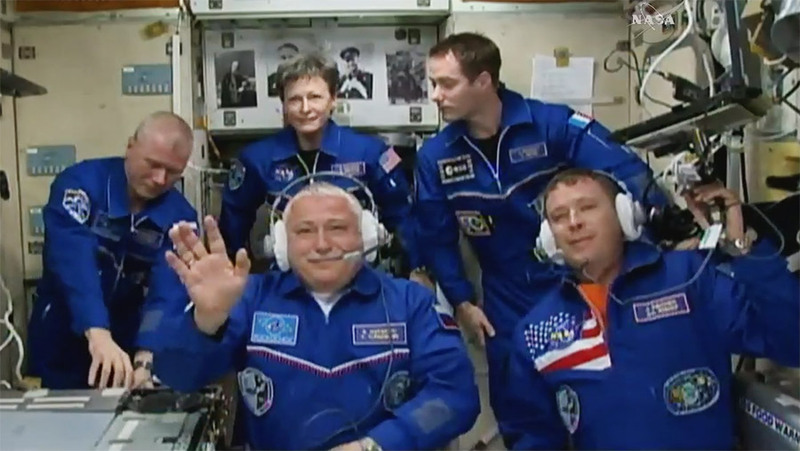 Two new crew members are aboard the International Space Station. The hatches on the space station and Soyuz MS-04 opened at 11:25 a.m. EDT, marking the arrival to the orbiting laboratory for NASA astronaut Jack Fischer and Fyodor Yurchikhin of the Russian space agency Roscosmos. Along with Expedition 51 Commander Peggy Whitson of NASA and Flight Engineers Oleg Novitskiy of Roscosmos and Thomas Pesquet of ESA (European Space Agency), the arriving crew members will contribute to more than 250 research experiments ongoing aboard the space station, in diverse fields such as biology, Earth Science, human research, physical sciences and technology development. http://www.nasa.gov/station. For launch coverage and more information about the mission, visit: https://blogs.nasa.gov/spacestation/. NASA astronaut Jack Fischer and Fyodor Yurchikhin of the Russian space agency Roscosmos have docked to the International Space Station’s Poisk module in their Soyuz MS-04 spacecraft at 9:18 a.m. EDT. NASA TV will resume at 10:45 a.m. for coverage of hatch opening. 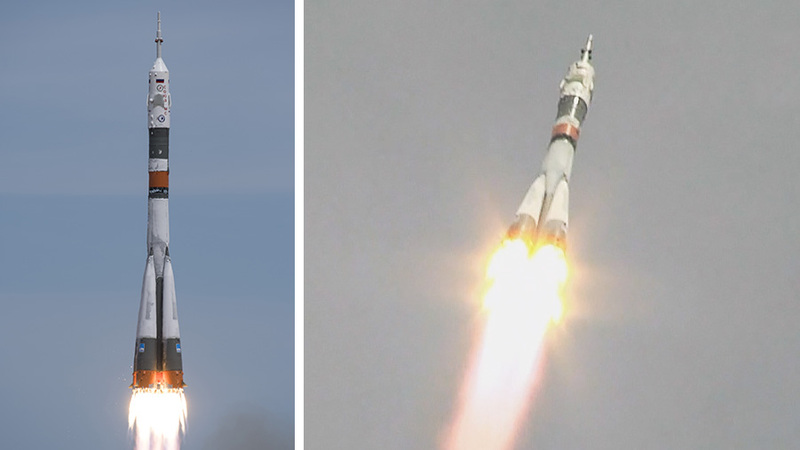 When hatches between the Soyuz and space station open at approximately 11:05 a.m., the two crew members will join Expedition 51 Commander Peggy Whitson of NASA and and Flight Engineers Oleg Novitskiy of Roscosmos and Thomas Pesquet of ESA (European Space Agency), who have been aboard the complex since November. http://www.nasa.gov/station. For launch coverage and more information about the mission, visit: https://blogs.nasa.gov/spacestation/. To join the online conversation about the International Space Station, follow @Space_Station. The Soyuz MS-04 launched from the Baikonur Cosmodrome in Kazakhstan to the International Space Station at 3:13 a.m. EDT Thursday, April 20 (1:13 p.m. Baikonur time). At the time of launch, the space station was flying about 250 miles over northeast Kazakhstan near the southern Russian border. NASA astronaut Jack Fischer and Fyodor Yurchikin of Roscosmos are now safely in orbit. The pair will travel on a fast-track, six-hour course to the space station and dock to the Poisk module at 9:23 a.m. NASA TV coverage of the docking will begin at 8:30 a.m. Once at the station, they will be welcomed by Expedition 51 Commander Peggy Whitson of NASA and Flight Engineers Oleg Novitskiy of Roscosmos and Thomas Pesquet of ESA (European Space Agency). Hatches between the Soyuz and space station will open at approximately 11:05 a.m. NASA TV coverage of hatch opening and welcome ceremonies will begin at 10:45 a.m.
http://www.nasa.gov/station. For launch coverage and more information about the mission, visit: https://blogs.nasa.gov/spacestation/. Get breaking news, images and features from the station on Instagram at: http://instagram.com/iss and on Twitter @Space_Station. Two Expedition 51 crew members are in quarantine today at the Cosmonaut Hotel in Baikonur, Kazakhstan, getting ready for their liftoff Thursday morning. Meanwhile, new science gear and crew supplies are on orbit right now and headed for the International Space Station this weekend. Cosmonaut Fyodor Yurchikhin is getting ready for his fifth mission to the space station on Thursday. He will ride to space with NASA astronaut and first-time space flier Jack Fischer aboard the Soyuz MS-04 spacecraft. The duo will launch at 3:13 a.m. EDT from the Baikonur Cosmodrome and take a six-hour, ten-minute ride to the Poisk module’s docking port. 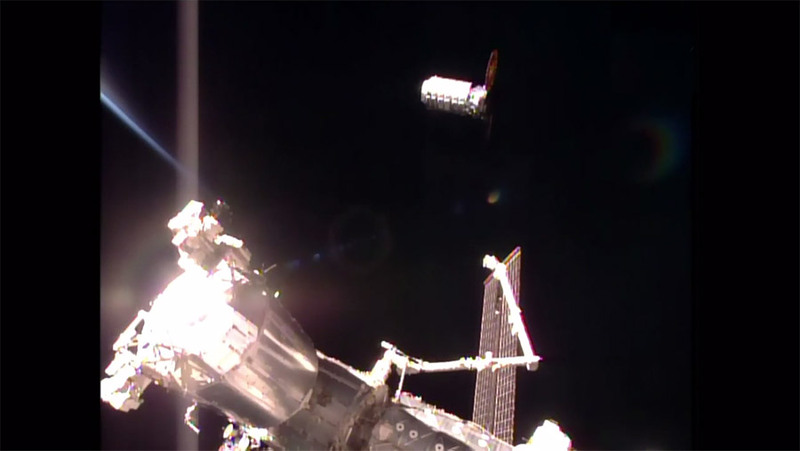 Two days after Yurchikhin and Fischer dock and join their Expedition 51 crewmates, the Orbital ATK Cygnus cargo craft will arrive to resupply the orbital laboratory. Cygnus will deliver experiments supporting research into cancer-fighting drugs, semiconductor crystal growth and atmospheric reentry conditions. Station Commander Peggy Whitson along with Flight Engineer Thomas Pesquet trained for the rendezvous and grapple of the Cygnus cargo ship Saturday morning. The duo practiced on a computer the robotic maneuvers they will use to capture Cygnus with the Canadarm2. The Cygnus spacecraft atop an Atlas V rocket (left) and the Soyuz MS-04 rocket rolled out to their launch pads today. 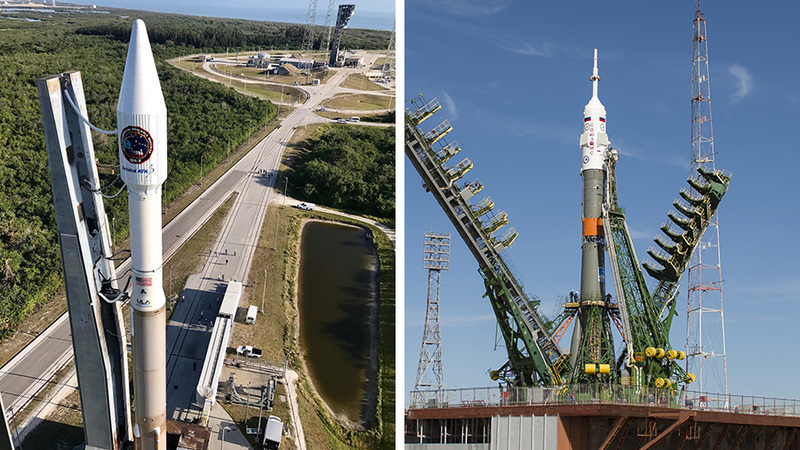 Two rockets on opposite sides of the world rolled out to their launch pads today ready to blast off to the International Space Station. An American rocket rolled out to its pad at Kennedy Space Center in Florida. A Russian rocket was carted by train and raised to its vertical position at the Baikonur Cosmodrome in Kazakhstan. The Orbital ATK Cygnus spacecraft is stacked atop the Atlas V rocket from United Launch Alliance and ready for its Tuesday launch at 11:11 a.m. EDT from Florida. The seventh contracted Commercial Resupply Services mission for Orbital ATK will deliver over 7,600 pounds science gear and crew supplies to the Expedition 51 crew. 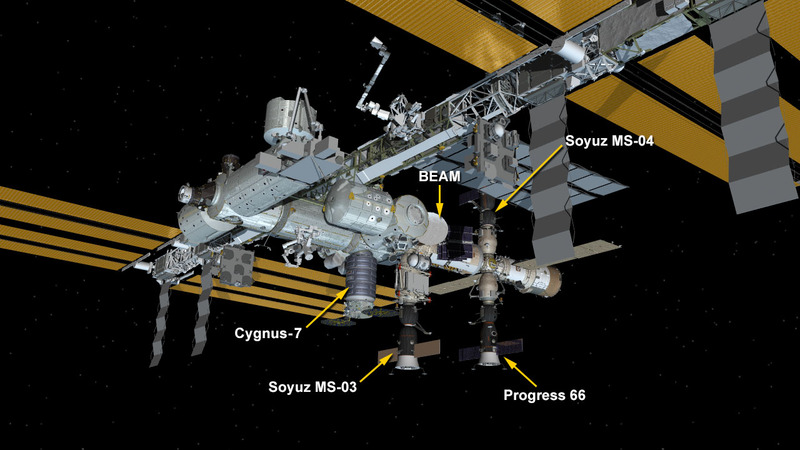 Cygnus is due to arrive Saturday morning for a robotic capture and installation to the Unity module. Two new Expedition 51 crew members will be seated in the Soyuz MS-04 spacecraft when it lifts off from Kazakhstan Thursday at 3:13 a.m. Just six hours and 10 minutes later the duo will dock to the Poisk module to begin a mission expected to last about 4-1/2 months. Meanwhile, the orbiting trio of Commander Peggy Whitson and Flight Engineers Thomas Pesquet and Oleg Novitskiy are getting ready for the new arrivals and continuing space research. Whitson explored how the brain adapts to microgravity while Pesquet set up hardware to collect body fluid samples for later analysis. Novitskiy focused on systems maintenance in the station’s Russian segment. The Cygnus cargo spacecraft was pictured after it was captured with the Canadarm2 on Oct. 23, 2016. United Launch Alliance (ULA) and Orbital ATK’s Launch Readiness Review for the Atlas V rocket with the Cygnus cargo resupply module was held April 15 at Cape Canaveral Air Force Station in Florida. Launch managers from ULA, Orbital ATK and NASA determined all is ready for a targeted launch to the International Space Station on Tuesday, April 18. The liftoff from Space Launch Complex 41 is scheduled for 11:11 a.m. EDT and there is a 30-minute launch opportunity available. NASA TV launch coverage will begin at 10 a.m. EDT on air and streaming at www.nasa.gov/live. Ten minutes prior to liftoff, NASA TV’s YouTube channel will debut full, 360 coverage of the launch at http://youtube.com/nasatelevision. Learn more about the 360 video coverage at: https://www.nasa.gov/press-release/watch-world-s-first-live-360-degree-video-of-rocket-launch-april-18. Follow progress on Orbital ATK’s seventh commercial resupply services mission for NASA to the space station at www.nasa.gov/orbitalatk. To subscribe or unsubscribe from this list, please email heo-pao@lists.nasa.gov. 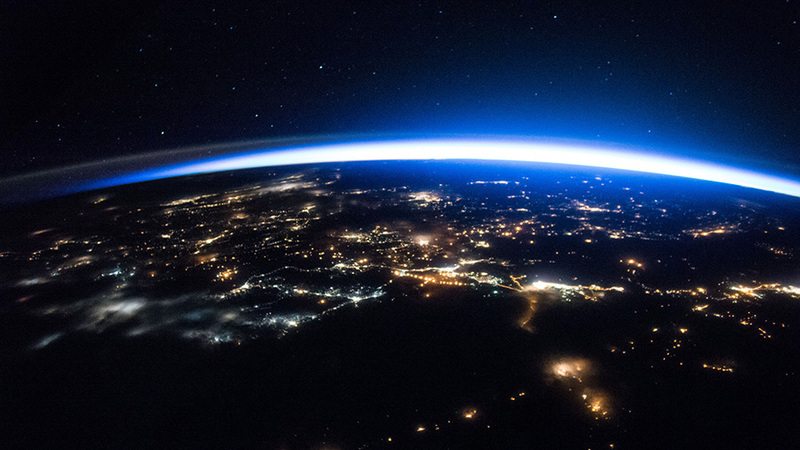 This night image from the space station captures sparkling cities and a sliver of daylight framing the northern hemisphere. The three International Space Station residents upgraded computer hardware and software today. The crew is also heading into the weekend preparing for the arrival of a new crew and a new cargo shipment. Commander Peggy Whitson and Flight Engineer Thomas Pesquet replaced outdated routers this morning with new ones providing expanded capabilities in the station’s U.S. segment. Whitson was in the Destiny lab module swapping routers while Pesquet was inside the Harmony module performing the computer maintenance. The router swaps and software updates were done to get ready for the arrival of the next station crew. Expedition 51 will expand by two crew members when a veteran Roscosmos cosmonaut and a first time NASA space-flier arrive on Thursday. Soyuz Commander Fyodor Yurchikhin and Flight Engineer Jack Fischer will launch aboard the Soyuz MS-04 spacecraft and take a six-hour, four-orbit ride before docking to the Poisk module. The duo will begin a mission expected to last about 4-1/2 months. Orbital ATK is getting ready to roll out its Cygnus spacecraft loaded with over 7,600 pounds science gear and crew supplies. 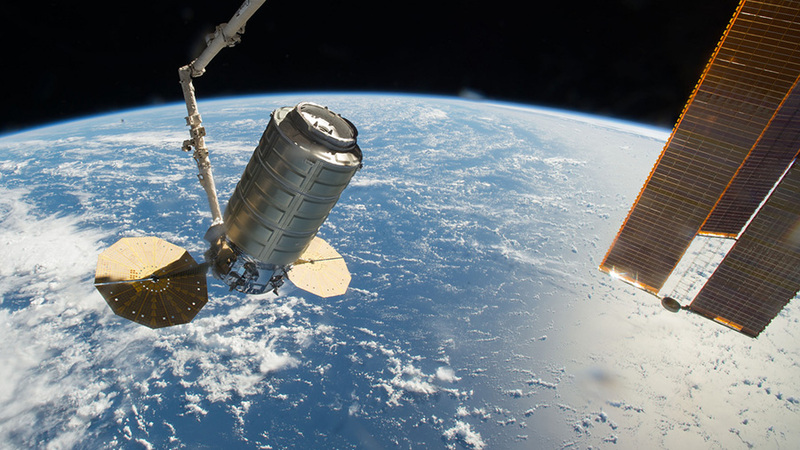 Cygnus is scheduled to launch Tuesday at 11:11 a.m. and take a four-day delivery trip before being captured by the Canadarm2 and installed to the Unity module.